Every year workers around the world celebrate International Workers’ Day on May 1st. We recognize this day in solidarity with millions of workers around the world. We commemorate the struggle for an eight-hour workday and the historic struggles of workers who have gone before us. In 1884, a law was passed in the US declaring that as of May 1, 1886, an eight-hour workday would be the full and legal workday for all US workers. The owners and employers refused to recognize this law and on May 1st workers across the country took to the streets in a general strike. Hundreds of thousands participated. In what would later be called the Haymarket riots, police opened fire on striking workers in Chicago killing several workers and wounding untold numbers. Workers across the nation mobilized against the government and its police brutality. From that day forward, workers around the world began to recognize May 1st as a day for workers to voice their just demands. May 1st is a day to celebrate workers around the world who continue to struggle for genuine labour rights and economic justice. Workers are demanding the right to accessible, affordable healthcare, child care, education, to employment benefits and a pension, to safe working conditions and a living wage. 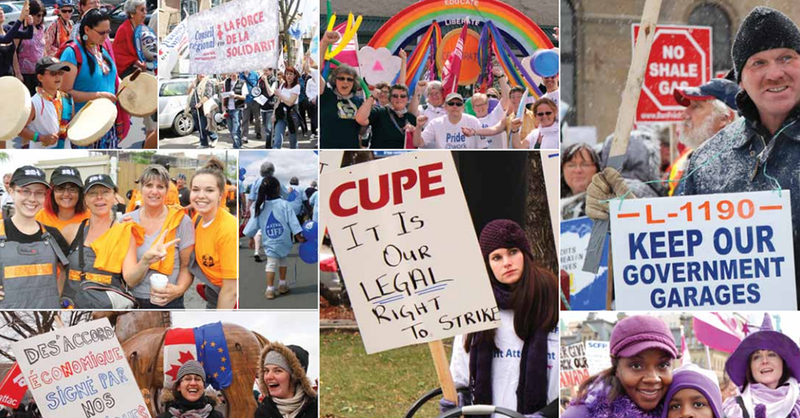 CUPE unites with our sister unions and partners in Colombia, Honduras, Nicaragua, Cuba, Bangladesh, and the Philippines. We support the right of workers around the world to collective bargaining and to resist exploitation. We support workers’ right to social and economic security. As the working class, we further assert our right in Canada to access a strong public sector, decent working conditions and democracy in our communities. On May 1st, we recognize and continue to act in solidarity with workers around the world. The struggle for women’s rights, migrant rights, minority rights, the environment, a fair economy, and social and economic justice knows no borders.